What does 2215 mean to me? 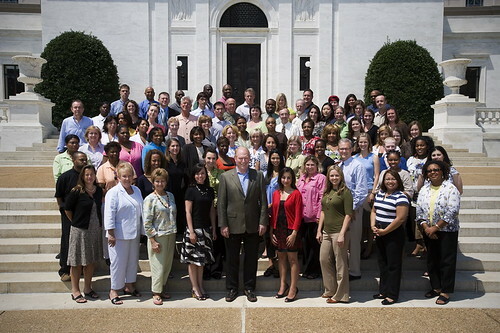 The APhA staff stands in front of our headquarters at 2215 Constitution Avenue. We're in the middle of a Board of Trustees meeting, so I've been in the APhA building about 12 hours a day from Friday to today. And I'm not alone. With me are an incredible group of volunteers whom our membership elected to provide leadership, advice, and fiscal oversight of your association. They also help us to make sure we are relevant as a membership organization by focusing on the right issues, providing the right services, and creating the right opportunities for you. Don't tell anyone, but once in a while during long meetings, my mind wanders a bit. This afternoon, I started thinking about what being at 2215 Constitution Ave. in Washington, DC, means for APhA. I can't cover the entire topic here, but I can say APhA means value to the profession of pharmacy. For every membership paid by a pharmacist, we generate $1,567* in services to members. These services take many forms, including tangible things like "free" CE, Pharmacy Today, JAPhA, JPharmSci, and Pharmacist.com and its tremendous content. We also lead several coalitions in order to help pharmacy organizations work together to solve our problems collaboratively. Our advocacy work on Capitol Hill and with numerous regulatory agencies like FDA, CMS, the Agency for Healthcare Research and Quality, and others is an essential part of protecting your profession and, more importantly, ensuring that the public gets the full value of their pharmacists' services. For us, 2215 and Pharmacist.com are an important part of our work, giving us a platform to represent you with policy makers who have a tremendous impact on your daily professional life. You can be proud, as I am, of the people who work here on your behalf, as well as the many, many volunteers who contribute their time to make your profession great. Thanks for reading. I'd better go. I've got to get back to the Board meeting. *Update, 9/17: We received a question about how I arrived at the $1,567 number: a $235 membership, divided by 15% (the percentage of APhA's revenues that come from memberships) = $1,567. APhA puts everything it takes in back into the profession in one way or another. All of our advocacy, programs, publications, research, training programs, etc. are built around what's best for pharmacists and their patients, and largely based on what our members tell us.